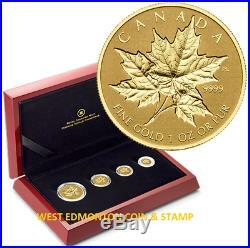 Theme: 2014 Gold Maple Leaf Fractional Set. Description: Each coin in this 4-coin fractional set is certified to be 99.99% pure gold see Product Specifications for individual diameters and metal weights. All four coins feature a reverse image by Canadian artist Pierre Leduc showing three overlapping sugar maple leaves on a frosted background. The top of the image features the embossed word "CANADA" while the bottom features the bilingual text "FINE GOLD" and "OR PUR" with the associated weight of each coin. Just to the right of the right-hand leaf is the purity standard of 9999. " The obverse features the date "2014, " the face value of the coin, the words "ELIZABETH II and the effigy of Her Majesty Queen Elizabeth II by Susanna Blunt. First incuse fractional set from the Royal Canadian Mint! The leaves on each coin have a carefully polished brilliant finish that highlights their details against the matte field. This rare set features four pure gold sugar maple leaf-themed coins in one-ounce and fractional denominations. The Royal Canadian Mint's world-renowned purity standard 99.99% brings exclusivity and prestige to the set. A highly limited mintage is sure to make this a sought-after set for collectors around the world. A valuable addition to any nature-oriented, Canada-themed, or fractional-themed collection. An exceptional gift for nature-lovers and lovers of Canadiana and the Canadian wilderness. Packaging: Coins are encapsulated and presented in a Canadian maple wood case, lined with flock, and protected by a black sleeve. Advertising Date: October 1, 2013 Launch Date: October 8, 2013. 2013 Gold Maple Leaf Fractional Set The leaf of the strong, resilient and bountiful sugar maple has long been a symbol of Canada. Beloved Acer saccharum, found readily across this land's rugged northeastern forests, has something to offer all year long, from the shade provided by its broad leaves in summer and the glory of its vibrant red, purple, and orange leaves in autumn to the delicious wonder of its sap in springtime. The reverse of the coins of this gold coin set features an image of three incuse-struck sugar maple leaves. Incuse is a method of coin striking that dates to the dawn of human coining which involves striking an image down into the metal rather than creating a relief. The earliest coin samples, from Ancient Lydia and most of Ancient Greece, were struck with rectangular punches that left an incuse impression on one side of the coin. Ancient coin-makers later integrated into the process a hand-carved bronze die which would impart a relief design on one side of the coin. Eventually, they innovated with the use of a second die. In some cases, this second die would be used to create a relief image on the reverse of the coin; in others, it was carved in intaglio, allowing coin-makers to produce coins with a relief image on one side and incuse on the other. The item "2014 PURE GOLD FRACTIONAL SET THE MAPLE LEAF" is in sale since Sunday, December 24, 2017. This item is in the category "Coins & Paper Money\Coins\ Canada\Commemorative". The seller is "westedmontoncoinandstamp" and is located in Edmonton, Alberta. This item can be shipped to Canada, United States.